As Federal agencies work to meet the demands of citizens for more accountability and transparency, IT execs must enable greater flexibility for users within the agencies, while maintaining tight controls over their computer environments. 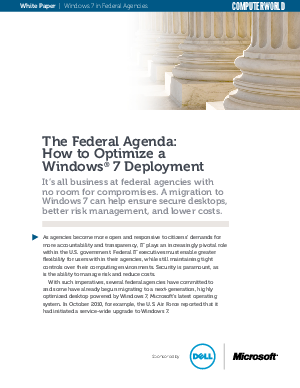 More federal agencies are migrating to Windows 7 for highly optimized desktops and security. Find out how.